Joe Zazzera, a guest blogger for Terrapin Bright Green, gives us a historical background on the use of “Nature in the Space” biophilic design patterns in interior spaces. “Nature in the Space” in biophilic terms means any design interventions that forge a direct, physical and ephemeral presence of nature in a space or place. One of the most significant “Nature in the Space” design patterns is Visual Connection with Nature (outlined in the 14 Patterns of Biophilic Design, published by Terrapin Bright Green in 2014). Some of the design strategies included in this pattern are potted plants, flowerbeds, courtyard gardens, green walls and green roofs. Plants in ancient times were first used for nutritional and medicinal purposes; the first known decorative use of plants was about 3,000 years ago by Egyptians. Not much is known about decorative use until the Victorian age when the English began to propagate plants in greenhouses. By the mid 1800s, indoor gardening had become a popular hobby in the United States and corporate greenery “Interiorscape” programs were first introduced in the late 1950s. Biophilia is the driving factor behind promoting views of nature indoors, whether it is a potted plant in an office, or a lobby atrium complete with water and fish. Until the last 15 years there was very little scientific evidence, some people simply intuited the need for nature in the space where we work and live. Everett Conklin was one of the early pioneers that brought plants into commercial interiors. Conklin and his New Jersey company, Everett Conklin and Company, installed their first large scale interior landscape in New York City’s Four Seasons Restaurant in the early 1960s. A little later the Ford Foundation, CBS Building, and Rockefeller Center became corporate clients. 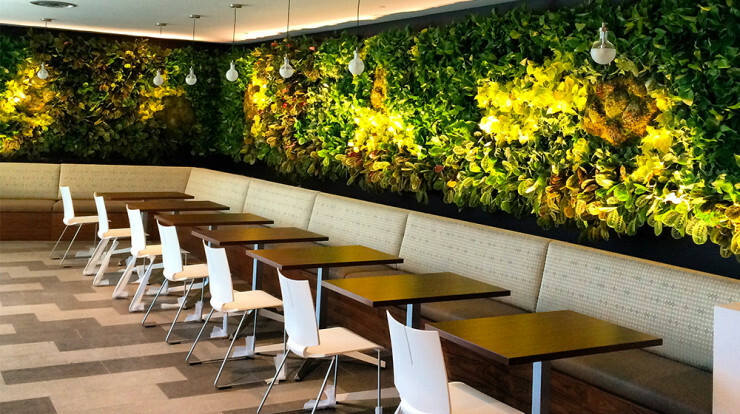 These early corporate installations were the beginning of the interior plantscaping industry that we know today. Before there was any notable research science, Conklin stated that there is a “primal association” with plants and flowers, that they aren’t luxuries but requirements of our biological heritage, that we need them in order to be happy. In 1972 Conklin published “Man and plants-a primal association” in American Nurseryman Magazine, where he posited his theory that man was genetically programmed to be near and around green, growing plants. During the same period, Conklin presented to the American Society of Horticultural Science and stated that the man-flora link was innate. With the popularization of planting indoors in the 60s and 70s, architects, designers, and builders began incorporating well-lit atriums and lobbies into their designs. The indoor plant industry flourished until energy became more costly and a greater concern for commercial building owners. Due to the energy crisis, the late 1970s and 80s saw the design and construction of many tightly sealed buildings with very little day lighting or provisional plant lighting. The result was less plants and more sick buildings due to trapped VOCs. One of the greatest challenges to maintaining indoor plant health is lighting. The absence of adequate lighting creates a slow death for any healthy plant. Conklin believed the secret to successful indoor plant care was acclimating plants to lower light levels prior to installation. This is a process which reduces the light level that a plant is grown under over a period of time, typically 12 weeks to 6 months. This practice created by Conklin is still used by quality plant growers today. Dr. Bill Wolverton had a long career as a research scientist at NASA’s Stennis Space Center. When over 100 airborne chemicals contaminated Sky Lab 3, Wolverton was asked to look for common ways to filter contaminants. He chose tropical plants as a potential strategy to solve the air quality problem. Wolverton studied the extent to which plants filter air by growing them in chambers filled with various VOCs while testing the air quality over time gradients. In his experiments, he was able to observe the effectiveness of specific plants at chemical removal. Wolverton’s studies found that the plants purified the air in the chambers. In addition, Wolverton also found that the plants were able to filter air in less time when contaminants were re-injected into the chambers, and that soil microbes also remove pollutants through breakdown. Wolverton’s first published research was in 1984, and in 1989 NASA published his report on interior landscape plants and indoor air pollutant abatement. Although there has been some debate on the quantity and scale on how to make plants an effective indoor bio-filter, Wolverton’s research set a course for future scientific research. Since 1984 there have been many additional technical papers and publications citing the effects of exposure to nature, including works by Tove Fleld, Virginia Lohr, and the landmark study by Roger Ulrich on the health benefits of nature views in hospitals. Validating our intuition with scientific evidence continues to support what many of us instinctively know: nature in the space can recharge us, make us more productive and lead to greater happiness. Since we are a society motivated by economics, the costs and return on investment of incorporating nature in the built environment is an important focus. The publication The Economics of Biophilia (Terrapin Bright Green, 2012) challenges our assumptions about cost and value. In a review of a series of studies, including one that deduced that 10% of employee absences could be attributed to architecture that had no connection with nature, the paper concludes that we can no longer ignore the financial benefits of including living nature and other biophilic elements in the built environment. Bringing together wellness and economic studies of nature in the space is having a profound effect on how we create our home and working environments. As our cities become more populated, the need to create indoor nature connections will become an imperative in everything we design. The health and wellness of our collective future depend on it. 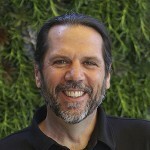 Joe Zazzera, an Interior Landscape and Living Wall designer, is the founding principal of Plant Solutions. He is President of Green Plants For Green Buildings, a 501c3 whose mission is to communicate the benefits of nature in the built environment. A Biomimicry Specialist, he is interested in the crossovers between biophilia, biomimicry and the functional integration of nature in the built environment. Images courtesy of Joe Zazzera.